Den Phillips, one of the leading maritime photographers, specialises in photographing Classic and Traditional Boats, Seascapes and characters involved. Her work is predominantly in black and white, but she also works in colour for magazines and brochures and for various Yachting Magazines. 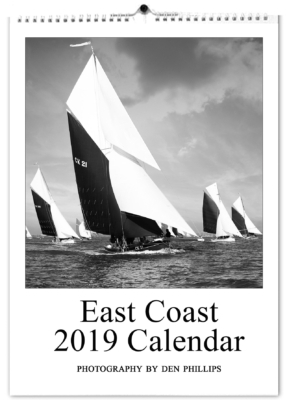 This year’s 2019 East Coast Calendar is celebrating it’s 31st year and to celebrate I have included a few of my favourite iconic shots from past Calendars along with some new images of Barges, Smacks, Classic Boats and Seascapes. Calendars are available individually and for corporate purposes with overprinting of company logos. Please contact me for larger orders. 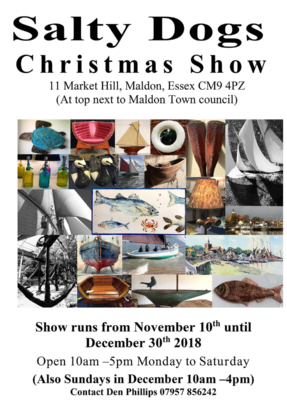 The Salty Dogs 2018 Christmas show is a great place to come and buy Christmas presents for the Salty Dog in your life. The shop is a bountiful showcase for the work of many local artists and includes quirky lamps, anchors, musical items with feather lampshades, sail cloth bags, stained glass, handmade soaps, candles, jewellery and of course my Black and White framed and unframed prints and much more. Not to be missed, we look forward to seeing you. 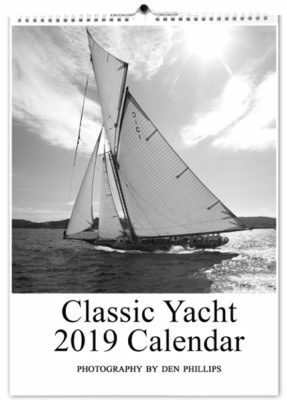 The 2019 Classic Yacht Calendar in its 20th year and features breathtaking images from the Classic Yacht Regattas Les Voiles de St Tropez and Antigua Classics. Calendars are available individually and for corporate purposes with overprinting of company logos. Please contact me for larger orders.